Recently, I had an opportunity to test drive a top-notch product that makes scheduling meetings at least three hundred times easier: Cogsworth. 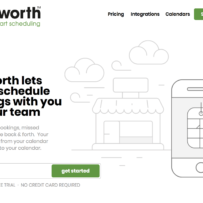 Based in Sydney, Australia, Cogsworth was created to take the pain and friction out of scheduling meetings. When you schedule meetings with folks via email, how many emails do you usually exchange? Three or four, right? Well, on average, people email each other at least three times in order to nail down a meeting time. 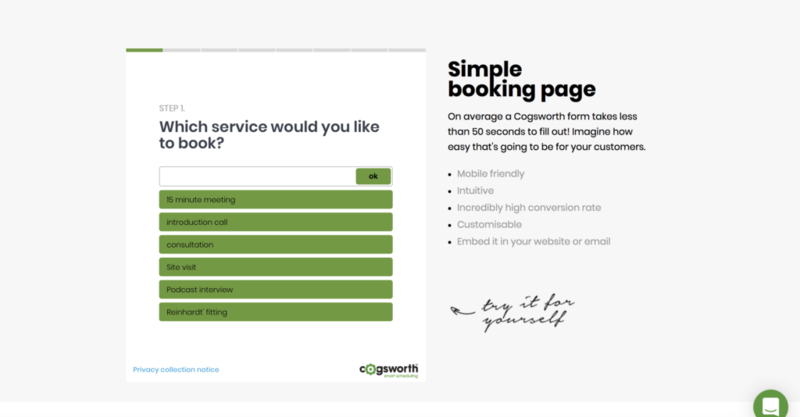 Cogsworth cuts out the email middleman and replaces it with a simple booking page. According to the company’s website, it takes a person less than 50 seconds to fill out this simple booking form. I can believe that because when I played around with the form, I filled it out in about 20 seconds. The form is mobile friendly and customizable, and you can embed it on your website or in your email. After you fill out the form to setup a meeting time, you can easily add the appointment to Google Calendar, Outlook Calendar, or download it as an ICS file. Once you fill out the form, Cogsworth sends you an email with the meeting’s details and a link in case you need to reschedule or cancel the meeting. Cogsworth also automatically detects timezones and works on every device. Thanks to this software, you’ll only need to spend a few minutes building a bookable service that clients and future clients will love. You can even use it to facilitate video conferences, and eventually, you’ll be able to accept payments through the form.